← “DC Vampires” – You Heard It Here First! While Matt at ComicsCavern.com and I were working on the 12 Days of Uncanny X-Mas in December, I cluttered up Day 8 with a little idea called “Marvel CounterPoint,” where denizens of the Marvel U. debated one another. In this case, a little discussion of politcal correctness between Cap and Shulkie. Well, now the good folks over at ComicsNexus.com have been kind enough to indulge me by hosting a weekly segment of Marvel CounterPoint by your favorite smartass and mine … me. There should be a new one up each week … and then I’ll broadcast “re-runs” on this site from time to time. And, while you’re there check it out. There’s some great commentary and truly funny stuff up on Comics Nexus. 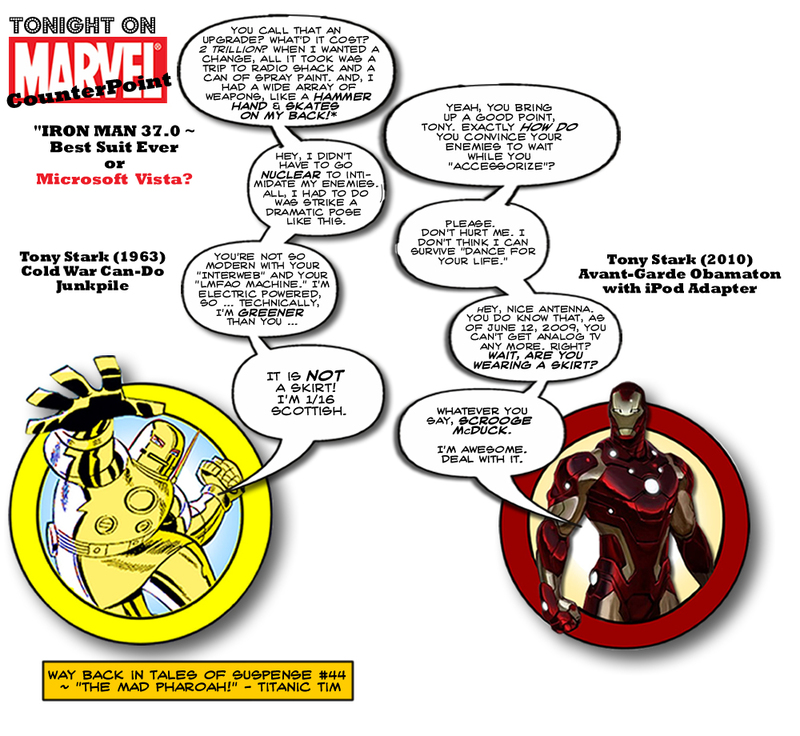 Now, let’s let Tony Stark debate Tony Stark on the merits of upgrading. Click on the image for a more legible version. This entry was posted in Avengers, Comic Book Humor, Comic Books, Marvel Comics, Marvel CounterPoint and tagged Comics, Iron Man, Marvel Comics, New Costume, Tony Stark. Bookmark the permalink. Drummer Extraordinare — Kim Pine! A Hawkeye & Mockingbird Moment: P-p-p-pym Particles!